The current 'Insert Bookmark' dialog does more than just insert a bookmark. It lists the available list of bookmark and also allows you to delete an existing bookmark, so i'd like to make the following change the dialog. 3) Change the bookmark list control into a control that has 3 columns - page number, bookmark id, bookmark text. Bookmark text would be the the first few words that appear after the beginning of the bookmark but would stop at a paragraph break. Setting NEW as ux-advise enhancement. Hmm, wouldnt it be better to simplify the dialog to really just cover the "insert bookmark" usecase? We have the navigator prominently in the sidebar now, and it appears to me to be a much more natural way to manage/delete/edit existing bookmarks. Unfortunately navigator is not a beginner friendly (aka Benjamin) interface, secondly there are users who wont use the sidebar due to screen resolution, thirdly we should have a regularly used feature like bookmark management in more than just the navigator. Yes it would be great to have context menu entries for bookmarks for jump and delete. For edit and manage, did you want to create another dialog for bookmark management or were you thinking that you wanted it in as a sidebar tab? The ui file is in sw/uiconfig/swriter/ui/insertbookmark.ui and the code in sw/source/ui/misc/bookmark.cxx . I want to work on it. Can I start? Is someone working on it already? > I want to work on it. Can I start? Is someone working on it already? Please go ahead. It's not assigned to anyone. I have a question about MVC model. I'm making a view control class that inherits from SvSimpleTable. This control will be usefull only for bookmarks. Can I put the logic of adding / removing bookmarks from internal container into this class? 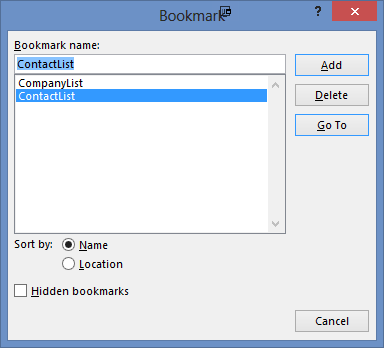 Bookmarks are identified with name. Should name be used as bookmark id? The Bookmark text can change. It needs to be updated every time dialog is opened. > I have a question about MVC model. > I'm making a view control class that inherits from SvSimpleTable. > This control will be usefull only for bookmarks. Yes, that should not be a problem. > Bookmarks are identified with name. Should name be used as bookmark id? - user given bookmark name is "bookmark id"
- "bookmark text" is the text that the bookmark points to (show just a portion of it), it needs to be updated everytime the dialog opens. Glad to see things are progressing for you Jakub. If you need any UI/UX help, you can find me in the libreoffice-design irc channel as jphilipz. As you are tackling this bookmark bug, you maybe be interested in looking at bug 45589. How the dialog looks in MS Word and Wordperfect. Here is a test document with a bookmark at the beginning of a line, selecting text within a line and at the end of a line. Should bookmark names be case sensitive? Is bookmark with name "Bookmark" and "bookmark" allowed at once? > Should bookmark names be case sensitive? > Is bookmark with name "Bookmark" and "bookmark" allowed at once? No they shouldnt be case sensitive, as they are currently, so yes it is allowed. Jakub Trzebiatowski committed a patch related to this issue. Miklos: As the dialog isnt modal, the insert button closes the dialog. For all non-insert interactions, the close button closes the dialog.